At Advantek, providing tomorrow’s product today is our mission. We are your premier source for items that enrich your life without getting in the way. This makes our products for pets and farms market leaders. It’s because Advantek products are simply better. The original and simply the best. 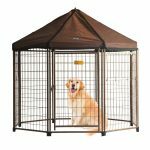 Advantek Pet Gazebo products offer amazing portability for you and reliable protection for your pets. Pet friendly design with a conscious. The Advantek Gone Green line features environmentally friendly materials to keep your pets safe and your mind at ease. Advantek Select products are some of our best. Using quality materials and the most innovative designs, Advantek Select is built to impress.